First, let me state clearly that the T-Rex series of burners is the most trouble free and low maintainence type of burner you can buy for your high temperature heating needs. These burners are delivered by the US Postal service, and what happens to them in transit can result in a misadjustment, but more likely your problem relates to the way its installed or used by the end user. I fully guarantee my burners to be free of materials or workmanship problems, but I can not help with problems created by the way its employed by the end user, other than what I am supplying in this trouble-shooting page. If you have problems that extend beyond those discussed in this page, please see "Technical Support" at the bottom of this page. Thank you. I have included information on other topics related to burners and forges, other than just trouble-shooting related items. Please drop to the bottom of the page for this information. The first thing to do is to determine if the problem you are experiencing is in the burner, or is a result of the way its installed in your forge or furnace. Your burner was fully test fired before being unassembled for shipment, so you will have to reassemble it correctly if its going to work properly. Here are a couple of things to check if your burner does not perform properly in a free air environment...that means clamped in a vise for testing, not mounted in your forge or furnace. Be sure that there is nothing obstructing the air intake ports, the interior of the burner tube, or the nozzle. Open the choke about 1/3 of its range, turn the gas on at a low pressure setting, about 2 psi, and ignite the burner at the nozzle carefully so as not to singe your hand. Let the burner warm up for a couple of minutes, and then run it through a series of tests at various pressures and choke settings. Slowly turn up the pressure to 6-8 psi, and adjust the choke while observing the flame. You should be able to watch it change from a greenish tinged flame at the more closed end of the choke range, to a more bluish flame at the open end of the choke range. 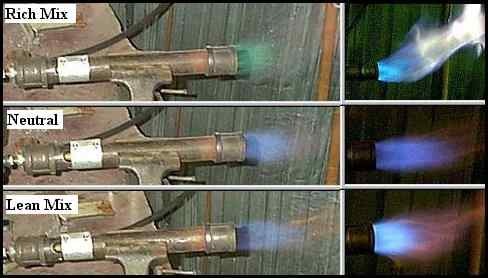 Take a look at the flame tuning image on Ron's web site if you have any questions as to how it should respond to the changes in choke settings. If it seems to respond well, and the burner flame changes from a very feeble output at low pressure, and closed down choke settings, to a mini jet engine at high pressure settings and open choke, the burner is functioning properly, and the problem is in your installation, not in the burner. However, if the burner does not seem to respond correctly, here are a few things to check, and the list is very limited because there are not many things that can cause the burner to malfunction. 1. As I mentioned at the beginning, look for any obstructions in the body of the burner, or its nozzle. Remove any that you find and retest as described above. 2. Check the jet tip location. Theoretically, it should be located at "D/2" from the throat of the burner tube. "D" is the inner diameter of the burner tube. So a 3/4" diameter burner tube would have a "D" value of 3/8". This is a purely theoretical value however, and you should loosen the lock nut at the rear of the burner air intake assembly and slide the jet in and out slowly at various pressure to determine the best location. Lock it down tightly after you are done. You will discover that the T-Rex burners are fairly immune to problems with this setting, and will operate well over a broad range of jet location settings. Adjust it for the best performance at the pressure you will most often be using. 3. Check that the nozzle location is correct. It should have approximately 1-1/4" of nozzle exposure beyond the end of the burner tube for a 3/4" burner, and more for larger burners. Loosen the lock screws and move the nozzle in or out, while adjusting the pressure and choke, as you did for the jet location test above, and determine the best location for the nozzle, based on the average gas pressure setting you will be using. The nozzle is very sensitive to the gas pressure you are running the burner at, as well as the choke setting, so you will need to work between both to determine the best location to lock down the nozzle. That is all there is to tuning or checking the burner. There is not much to go wrong with these burners, and they will provide you trouble free service for many years if they are not abused, or incorrectly installed in your heating device, especially if you don't forget to close the choke completely the moment you shut off the gas to prevent the burner from becoming a chimney to vent the ultra hot gasses in the forge. I will provide you a few more tips below that relate to the forge or furnace installation, and some possible problems to look for there if your burner works fine on the free air test, but not in your forge or furnace. This will be a restatement of much of the information that can be found on Ron's pages, but it may save you some time if I put it here as well. This will not be a comprehensive treatment of the subject, so you will have to refer to Ron's Forge Design Page, or his Forge and Foundry Page, if you need further information. Please do not contact me for problems in this area. Thank you. 1. The first item, and a very important item to check, is your nozzle placement in the forge wall. It should not penetrate into the interior of the chamber. It will melt or burn off if it does. Have it set back into the Kaowool, or rigid refractory, an inch or so, and continue the taper of the nozzle flare through the refractory. The refractory should seal tightly around the outside of the flare so as not to allow any gasses to pass either direction, into or out of the chamber. If you have a rigid refractory shell, you may want to consider not using a flare on the burner and casting the flare taper right into the refractory. This will eliminate the problems associated with high temperature degradation of the metal in the flared nozzle. 2. Because there is a very large increase in the total volume of the gasses entering the forge, by a factor of 7:1, the volume coming out the exhaust openings in the forge are far greater than the volume entering the forge. If you have any restrictions, such as doors, or too small of an exhaust port, the back pressure will cause the burner to operate in an erratic and improper fashion. Be sure you are not causing back pressure on your burner. 3. A forge chamber that is very long but of small diameter, 3-4", may cause a back pressure problem, even if the end openings are big enough to vent the chamber properly. Some knife forge designs can run into this problem. Allow enough diameter for the burner flame to enter the chamber completely and properly. It should not blast up against a chamber wall from close range. This will also cause erosion of your chamber wall where the intense flame impinges upon the refractory. 4. Although the burner may function properly, if the burner opening is too close to the forge floor, so that the floor is directly impacted by the blue cone of the flame, any metal placed in the flame will be in an oxygen rich portion of the flame, and the raw unburned oxygen will cause scaling problems. Allow enough burn distance to consume the oxygen. One of the big advantages of nozzle initiation burners, like the Reil, EZ, and T-Rex series, burners, is that the burn starts up in the burner, thus consuming the oxygen earlier, and helping to prevent the oxidation that occurs with chamber burn systems. Also, the temperatures will be higher because the chamber is not receiving any cold unburned gasses, only the ultra hot fully consumed gasses after the burn. 5. Another issue that may be a problem in your system is the regulator and plumbing. A BBQ regulator will not work...hands down. Don't even try using one unless you wish to set yourself up for failure. They do not deliver the necessary pressure, nor the necessary BTU output. Get a high quality Fisher, hand adjustable, regulator, or another of equal quality, not one of the cheap Chinese clones that have become available lately. It should have a pressure range of 5-30 psi. They will actually operate smoothly from 0-30 psi, but the liability involved with people using the regulator as a shut off valve, if they list it as going to zero psi, is a problem that has been solved by listing the bottom end pressure as 5 psi. Connect the regulator to the burner supply manifold, for multi burner forges, or directly to the single burner, with 3/8" or 1/2" diameter plumbing. You may use 1/8" copper pipe for the short distance from a manifold to your burners without flow problems. Be sure there are no particles of metal or other "junk" in the plumbing, because the tiny jet in the burner can easily become obstructed when the flowing gas carries a particle into the jet and it becomes lodged in the orifice. It is a very good idea to blow the gas plumbing clear with compressed air prior to final connection to the burner, just in case there are some residual contaminates in the propane supply system. If you encounter flow problems, check the jet orifice for particle obstructions. You can use a torch jet cleaner, or any fine wire, to clear any junk from the pathway if its not clear. Be careful not to damage the smooth surface of the jet interior. 6. There are two more items I will mention, but only as a cautionary note. The first involves burner position. There have been reports of burner malfunction in atmospheric burners when they are mounted vertically in a furnace or forge. This is not specific to the T-Rex line, but to all atmospheric burners. Apparently a problem can develop when the rising hot gasses interact with the down flowing gasses in the burner tube. I have been unable to duplicate the problem when conducting tests, but that doesn't mean that it can't happen. Be aware that vertical burner positioning can cause a problem that may cause erratic operation or flame-out. The second item regards propane contaminate deposition in the jet of the burner. Apparently some propane has more contaminates than other propane, depending on its source. You may need to periodically clean out the jet of your burner if your propane leaves a tarry deposit over time. You will simply see a degrading performance over time, but cleaning the jet tip will quickly bring your burner back to like new performance. I will add information to this section as it comes to mind. This part of the page will deal with various items related to burner mounting, as well as forge or furnace operation. To mount your burner to your forge/furnace you will need to construct a bracket that will allow the burner to be mounted and locked securely in place. This image is one possible design that you may wish to employ. The image is full scale, so is a large file. You can modify it to allow burner mounting at angles other then perpendicular to the surface of the forge shell by cutting the weld end to whatever angle you desire. For melting furnaces, the burner is generally mounted tangentially to the interior chamber wall to create an intense vortex, and to prevent the flame from playing directly on the crucible. The collar is attached to the furnace/forge by welding it to the steel outer shell. You can modify the diameter of the collar to fit any of the burner models I have available. Just be sure to allow enough clearance to pass the outer diameter of the burner nozzle or you will have to attach the nozzle after mounting the burner to the forge or furnace....not recommended. Here's an example of a two burner arrangement with a separate valve for each burner. Note also that the regulator shown would be in addition to the regulator at the propane tank. I offer a kit with a 0-60 PSI high pressure regulator plus the valves and everything needed ecxept 1/4" copper tubing for an idle / full burner control. See the ordering page for details. Many guys like to "poor boy" it, cut corners, and spend as little money as possible, when building a forge or furnace system. This is a verybad idea. You are working with a potentially lethal substance, propane, and cutting corners can only subject you to hardware failures that would not be a problem with higher quality parts and materials. When your life or health may be on the line, it is only prudent to buy only the very highest quality hardware, both for the plumbing and the regulator. Any valves should be rated for propane, and of the very best quality possible, such as "Jomar Super Ball Valves." Do not use water system plumbing from your local hardware store. Water and flammable gas are not the same. A leaking valve could be catastrophic in an indoor shop. Using high quality components that are rated for propane will generally be much safer, the most cost effective in the long term, and will be far more satisfying to use. If you bought one of my burners, you bought the best, please use it in a device of equal quality. Well, hopefully the above information has helped you to locate your problem and correct it. If not, I am sorry I am not able to offer further support beyond what I have posted here for problems that are not directly a result of a problem in the burner itself. If you have a problem that is a result of how you are using the burner, I can't offer technical support in that area. If the burner has a problem burning in free air, feel free to contact me. Thank you.